We offer private in-home training for dogs and puppies. The benefit of private training is that you will be given one-on-one instruction on how to implement a customized training plan, taking into consideration your dog's particular issues and the set-up of your home. Private lessons can address basic manners as well as more complicated behavioral problems. Lessons may be paid for one at a time or multiple lessons at a discount may be paid for at the end of the first lesson. Appointments are arranged directly with the trainer to take place at a mutually convenient time. Saturday and some evening times are available. For many people, having their dog walk nicely on a leash is an enormous challenge. Dogs naturally tend to pull on the leash and become easily distracted on a walk. But teaching your dog good leash-walking manners isn't impossible. It just takes a little know-how and consistent practice. Even older dogs can who have been pulling for years can be taught to walk nicely on a leash. Our Dog Walking 101 package of three sessions will give you the tools you need to motivate your dog to want to walk with you. We never use prong collars, choke collars, or electric collars to achieve our goals. We will help you teach your dog to be a great walking buddy using only positive reinforcement methods. Laughing Dog Academy trainer Sarah Stoycos offers classes for puppies at the Your Dog's Friend training center in Rockville, MD. Puppy Kindergarten: This class is for younger puppies. Any puppy who has had his/her first round of shots is encouraged to begin right away. It is important for puppies to begin a well-managed socialization process as early as possible to prevent problems that may crop up later without that proper socialization. The class uses a rolling enrollment process, so you may begin in any of the classes as long as there is room. Sarah teaches Puppy Kindergarten classes on Sunday evenings, and Monday evenings as well as Monday and Wednesday mornings. Puppy Kindergarten consists of six classes at a price of $175. Please register on the Your Dog's Friend website. Puppy First Grade: For puppies who have completed Puppy Kindergarten, this class reinforces skills learned in Kindergarten, gives puppies a chance to try out agility games, and helps parents to teach their puppies how to maintain focus in the face of life's many distractions. Your puppy will even get a chance to try out a skateboard! Classes are six weeks long at a price of $175. Unlike Kindergarten, First Grade does not use a rolling enrollment process. Classes are usually held on Monday evenings and Wednesday mornings, but check the Your Dog's Friend website for details as these times sometimes change. Puppy Party: On Tuesdays and Thursdays from 1:00 to 1:45 p.m., you may bring your puppy to a session of organized and well-supervised play with other puppies that is good for both outgoing and shy puppies. The class gives your puppy more opportunities to meet new puppies and people, and helps them hone their socialization skills and build confidence. Once you are registered, you may attend on a drop-in basis. The cost is $20 for each 45-minute class. Sign up at Your Dog's Friend. Sarah teaches these classes with fellow trainers Susan Sanderson and Lisa Arant. Out and About: Put those training skills to use out in the real world! In Out and About, we hit the road for four classes. Each is held in a different location, ranging from parks to more urban areas. Participants have the opportunity to work with a trainer in settings closer to real life rather than in a training center. It's a great way to take your training to the next level and to learn how to use all the tools you have learned in other classes. See the Your Dog's Friend website for more details. Days and times of the class varies. The fee is $130. Come! Oh, do you mean me? : Come to this two-hour class and learn how to help your dog really want to come to you when you call him/her. You and your dog will practice targeting skills and recall games that make coming to you fun. To participate in class, your dog must be friendly with people and other dogs. See the Your Dog's Friend website for more details. This class takes place on Saturday every few months. The fee is $50. Leash Manners: Have you taken a training class but your dog still pulls every which way on walks? Maybe some focused work will help. With lots of practice during this two-hour class and then at home, you will have the skills needed to start enjoying more pleasant walks wherever you go. See the Your Dog's Friend website for more details. This class takes place on Saturday every few months. The fee is $50. Please Stop Jumping! : Embarrassed by your dog jumping on visitors? Tired of finding your dog counter-surfing for tasty forbidden treats? In this two-hour class, you will learn ways to work on keeping your dog’s four paws on the floor. Together we will explore training exercises and management techniques that will help make your dog a more polite member of your family. To participate in class, your dog must be friendly with people and dogs. See the Your Dog's Friend website for more details. This class takes place on Saturday every few months. The fee is $50. It's All Just Fun and Games! : Use games to strengthen manners while having fun. Games strengthen skills like polite leash walking, attention to handler, sit, down and stay. Dogs also learn to improve their ability to focus in the presence of distractions. 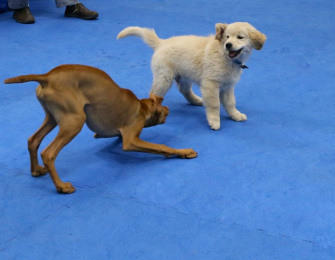 Prerequisites: completion of a basic manners or puppy class at Your Dog's Friend or, with instructor’s permission, other previous positive training. Dogs should be comfortable with other dogs and be non-reactive. See the Your Dog's Friend website for more details. The fee for this six-week course is $165. Treibball for Fun: Learn the basics of the game of Treibball, a herding game for dogs of all kinds. Dogs learn to push large balls into a goal. Herding breeds are not the only dogs who excel. Great for dogs of any size. It's fun and also helps dogs improve impulse control. Dogs should have had a Basic Manners or Puppy Kindergarten class (or the equivalent) and have a good sit or down stay. See the Your Dog's Friend website for more details. The fee for this six-week course is $165. Online Reactive Dog Class: In this class, you will learn how to handle the difficult situations that arise when you live with or walk a reactive dog. It is designed to help your reactive dog become more focused and confident. The online class is good not only for dogs who react to other dogs, but is also for dogs who are reactive to people, including those coming into your home, dogs that have caused serious injury to others, or dogs spooked by trucks, balloons, bikes, or other indoor or outdoor triggers. See the Your Dog's Friend website for more details. Payments are required at the time of service. We accept cash, checks, and major credit cards, including MasterCard, Visa, American Express, and Discover.